Strixon Manor Business Centre was created in 2005 when traditional farm barns were renovated into high quality office space. The working farm adjoining the Business Centre is a showcase for how wildlife and habitat creation can be integrated into farm production. David Hutchinson, who manages the land, has scooped a prestigious environmental accolade, beating competition from across the country to win Natural England's 'Future of Farming' award. Recognised for his focus on farming in harmony with the natural environment, he has achieved environmental excellence and innovation in farming. A range of environmental land management techniques are used across Strixton Manor Farm, particularly field buffering; creating wild flower margins around crops to encourage insect, wildlfe and bird populations. A lake which is a Site of Special Scientific Interest (SSSI) is actively managed to create a habitat so as to attract a range of wading birds, ducks and geese. Historical interest within the parish is preserved by the constant maintainence of buildings and archaeological interest under cropped land is preseved by reducing cultivation depth or sowing the land to grass. 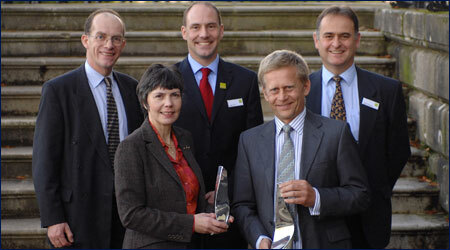 Announcing David's award in November 2008, Sir Martin Doughty, Chair of Natural England, said, "David's commitment to producing high quality crops while enchancing the natural environment is a superb example of what can be achieved. He has very successfully developed a profitable farm business where wildlife habitats have been actively supported and wildlife friendly farming techniques have been showcased". The farm jointly with the Strixton Manor Business Centre hosts training courses for a wide range of industries and charitable organisations. David's contact is david@strixtonmanor.co.uk.